Did you know that Benevento, where Strega liqueur comes from down in Italy’s south was once the annual general meeting location for all the witches in the whole wide world? Probably not, although this was once the case, or so the legend goes. And you may not have known that strega is Italian for witch, but you do now. There must have been a few Harriet Potters at these annual witches’ meetups too one imagines, and they were looking for a suitably enchanting liqueur, no doubt. Maybe the witches’ world get together took place at Halloween? To keep all those witches at their international world congress content and to ensure, possibly, that Benevento did not go through any bad spells, someone, back in 1860, reputedly one of the ancestors of Alberti, the current maker of this spellbinding brew, came up with the wizard idea of creating a suitably enchanting liqueur. Perhaps the people of Benevento figured that a strong enough liquor would help their cackling guests sleep through the night instead of striking terror into the locals and transforming the odd husband or two into frogs, or worse. To create a potent potion capable of appealing to and placating such an unusual clientèle, no less than seventy herbs and spices from around the world were combined into the then new Strega liqueur drink; presumably a cauldron was employed and most likely the advice and assistance of a few of the annual congress attending witches was sought too. After all, nobody, one imagines, aside from a bunch of witches, could possibly manage to combine so many herbs and spices and come up with something that was both drinkable and that would appeal to the members of various witch conference attending covens. Some market testing, resulting in the purveyors of the test versions being transformed into toads, warthogs and three headed dogs by wand waving witches who were not overly appreciative of the trial blends, is rumored to have occurred. Eventually though, the right potion was conjured up and this particular Strega liqueur witches’ brew came into being. To add to the attraction of this new liqueur, a magical color, designed to appeal to the broomstick traveling hags no doubt, was chosen. The peat-bog brown of whiskey was out, as was the uninspiring transparency of one of Italy’s most popular, and potent, spirits: grappa. Instead, an eye catching luminescent yellow was chosen. The distinctly unnatural color is bound to have attracted the attention of a passing witch or two. Thus and in honor of Benevento’s bewitching company, the curious drink was named Liquore Strega or Witches’ Liqueur – or Strega liqueur. 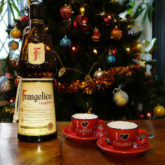 This curious Italian liqueur made from natural ingredients is sometimes advertised on Italian television on the run up to Christmas and this curious Italy resident decided to try it. Here’s what I discovered. Strega liqueur has a rather odd odor, something like gin, but not quite. It’s pretty strong stuff too and is to be avoided at all costs if you are driving, unless you want the local cops to magic away your driving license. After one shot of this potent Strega liqueur, call a cab. The taste of Strega liqueur is unlike anything else I’ve tried in Italy aside, perhaps, from an odd greenish liqueur which can be found in the Genoa area of Italy. There’s a faint hint of lemon in Strega liqueur and it is fairly sweet too. Most unusual, but interesting at the same time. This Italian witches brew is rather versatile too and can be poured over ice cream, fruit, or simply drunk neat, or, in the summer heat, on the rocks. Alberti, the Benevento based maker of this bewitching beverage, has a selection of Strega recipes, both savory and sweet and Strega cocktails, including one especially for opera lovers – the Strega La Scala. 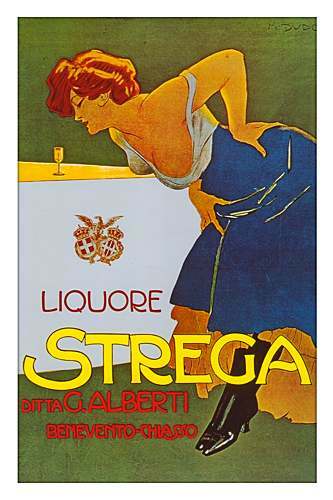 Strega liqueur is definitely worth trying – if you are over 18 and can find it – and to track down a bottle, you could pay a visit to your local Little Italy neighborhood, if you are lucky enough to have one nearby. A bottle of Strega liqueur would make quite a talking point at the end of an evening dedicated to Italian food or any other good eats, for that matter. This spell binding Italian Strega liqueur from Benevento qualifies as yet another Good Italian Thing on Italy Chronicles. Of course, if you happen to be a passing witch and are planning on a witches’ AGM revival in Benevento, you could create a cauldron full of Strega liqueur there. It’ll enchant you and your wizard friends! 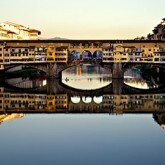 I was enchanted by Strega ever since I saw the movie “Rome Adventure”. Troy Donahue and Suzanne Pleshette drank Strega sitting by a famous fountain. In 2008 I got to go to Rome and sat in the same place and my wife & I drank Strega. my strega lost color . is it still good? No idea Frank. How old is it? Might be time to get a new bottle. First time I’ve heard of discolored Strega! Not sure it’s ‘disturbing’ but it will be corrected, Tusca. u have any promotional posters for any of the liquors, coffee (lavazza) & your business that i can request from you? Nope, John, don’t have any promo material for products. I just write about liquor and coffee.